When Paterfamilias and I were young and starting our life together, we picked up stakes and left New York City for Washington, D.C. Almost all of our friends have similar stories to tell. One left Nebraska and lived in Alabama before making a home in the east. Another hightailed it from New Jersey to Seattle, got married and moved east with a spouse who took a job here. That was then. Evidently, it's not happening now. 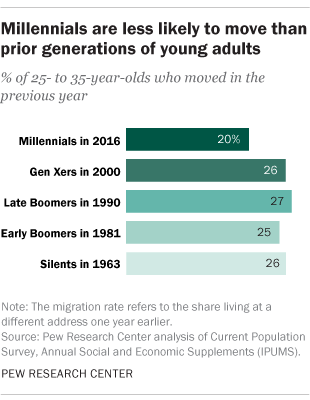 According to Pew research, Americans overall are moving about the country at the lowest rate on record and a primary reason is Millennials: They are staying put at a significantly higher rate than earlier generations of young adults. 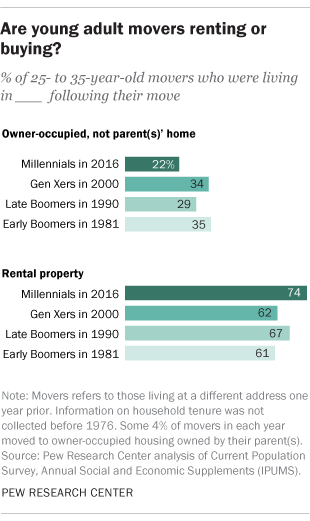 In 2016, only 20 percent of Millennials who were 25- to 35-year-olds reported having lived at a different address one year earlier; in the mid-1960s that percent was 30. --Having a spouse. Marriage is a drag on mobility since a move generally means two people have to line up new employment. According to Census data, in 2016, only 42 percent of Millennial 25- to 35-year-olds were married and living with their spouse; in 1963 it was 82 percent. --Owning a home. It is usually less disruptive and less costly to move from a rental apartment than it is to sell a house, so one would expect renters to be more mobile than homeowners. In 2016, only 37 percent of Millennials in the 25- to 35-year-old age span lived in owner-occupied housing (not owned by their parents). In 1981, 56 percent of early Baby Boomer 25- to 35-year-olds lived in such housing. --Being parents. They don't have kids yet. It's much more difficult to pick up stakes when children are part of the household. In 2016, a majority (56 percent) of Millennial 25- to 35-year-olds didn't have a child of their own living with them. Fewer than half of Gen Xers and Boomers were childless at a similar stage of life. If you want to visualize the mobility stats, here are the Pew charts plus a link to the Pew report.